In 2012 I left the Marine Corps and enrolled in the University of Colorado’s Denver campus. At first, I had no idea what to study, so I leaned toward teaching. After a semester or two I decided on an International Studies degree. I’ve always loved learning foreign languages. In high school I took three years of German, and another semester in college. I attended an intensive Pashto course before my second deployment to Afghanistan. When I finally began learning Arabic at the University of Colorado, I knew what I needed to do to truly understand the language. I needed to study and speak Arabic in the Middle East. During my time in Afghanistan, I spoke Pashto every day with ancient-looking elders who fed me information about Taliban movements. The Pashto I spoke with them differed slightly from the northern Pashto I had learned in Hawaii, so I adapted to the new dialect by speaking it every day. By the time I left Helmand province, I could hold a detailed conversation with an elder without the need for an interpreter. If you are a veteran on an International Relations degree path, or you are studying a foreign language, or you simply want to get out of the country for a while, studying abroad is invaluable to your long-term success. There are hundreds, if not thousands, of programs for dozens of different countries available for students of all ages and degree paths. The focus of study abroad programs can vary depending on your goals and the amount of time spent overseas. Furthermore, these programs can either be sponsored by your school or run by other organizations. The choice of program depends on your school, your goals, and your budget. If you use the Post-9/11 GI Bill, as many veterans do during their undergraduate studies, you may be able to pay for a school-run study abroad program. Let’s say you attend the University of Arizona and you choose to study in Brazil. You apply for the program, are accepted, and eventually the tuition gets added to your bill. You will need to meet with your advisor and ensure that the 2.5 credits earned go directly toward your degree path, either as curriculum requirements or as electives. Your certifying official will then be able to ensure that the Post-9/11 GI Bill pays the bill. 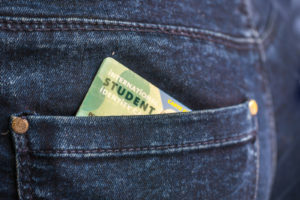 You will be enrolled as if it were a regular semester; this includes BAH payments, but will not include airfare or miscellaneous expenses in-country. Oftentimes your school will not have a program available which meets your particular needs. At the University of Colorado, for example, there were no Arabic-based study abroad programs to choose from. Choosing an outside study abroad program is easier if you consult your Office of Global Education or Study Abroad office; they have knowledgeable staff who can, at the very least, point you in the direction of a company which offers programs in your part of the world. For me, it came down to a choice between Amideast and CIEE. These are both non-profits which offer educational exchanges. Amideast is focused primarily on the Middle East while CIEE runs programs all over the world. I found the application process at Amideast too difficult for a simple Marine Infantryman like myself, so I chose CIEE instead. I’m glad I did. One issue with choosing outside programs is that funding can be difficult to come by. If you are using the Post-9/11 GI Bill you probably know by now that the Federal Student Aid forms you fill out give you free money from university and federal grants, as well as scholarships administered through your school. It is essential to take advantage of any study-abroad specific scholarship opportunities at your school. Furthermore, there are several large outside scholarship opportunities for which you can apply. I would recommend applying for all of the scholarships you can; you may find yourself spending more money overseas than you originally budgeted, even if you are using the GI Bill. The Foundation for Global Scholars offers scholarships each year to young global scholars. The Benjamin Gilman Scholarship, which I won last year, awards money for summer and semester programs, and also features a Critical Need Language award for those studying languages deemed of great importance by the U.S Department of State. The Critical Language Scholarship differs from the Gilman program. It offers a fully-paid opportunity to study a language of critical need to the government, but only at pre-approved sites. I would encourage anybody studying International Relations or foreign languages to look at the list of languages and countries and apply for this scholarship. The languages offered include Arabic, Indonesian and Punjabi, among several others. The program only allows participants to study certain languages at particular levels; for example, CLS does not accept applicants for the study of Russian without at least two years’ prior study. Your experience overseas in a study abroad program will be as fun and productive as you are willing to let it be. I was a full four years older than most of the other program participants when I studied in Amman. At times, the immaturity of my companions wore on me. I also did not appreciate the often inefficient program staff and their attempts at organizing events. After a couple of weeks, though, I learned to enjoy the company of these young kids. I had an exceptionally rewarding cultural experience. I drank beer in Amman, Tel Aviv, Jerusalem and Ramallah. I spoke Arabic with strangers. I played chess on a street corner with an old bookshop clerk. I rode in a cab with a Palestinian, a Syrian, a Sudanese man and a Jordanian. I did all of this and much more. I feel like perhaps I appreciated my time abroad outside of my military service in large part because I could make friends and experience a foreign land without carrying a weapon. I encourage any and all interested veterans to speak with their Study Abroad office and begin looking at programs immediately.